Anything less than optimal health of your vehicles and machinery can lead to breakdowns, increased maintenance expenses and even work stoppages. 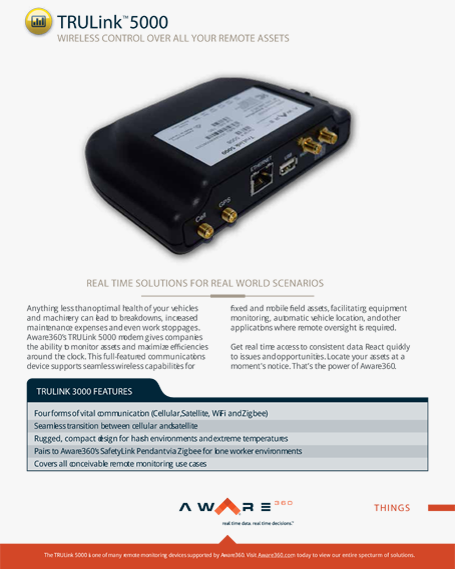 Aware360’s TRULinkTM 5000 modem gives companies the ability to monitor assets and maximize efficiencies around the clock. This full-featured communications device supports seamless wireless capabilities for fixed and mobile assets, facilitating equipment monitoring, automatic vehicle location, and other applications where remote oversight is required. Trust us, it’s filled with secrets!